Dear readers and my fellow bloggers I'm so decked up to tell you all that Trendy Mannequin is soon gonna launch its first magazine ever. This is the reason I'm not able to concentrate much on my blog and have been researching for my magazine since 4 weeks. Anyways, this was one of those posts which I enjoyed writing the most because it reflects my 5 favorite girlie flicks which is also loved by many. 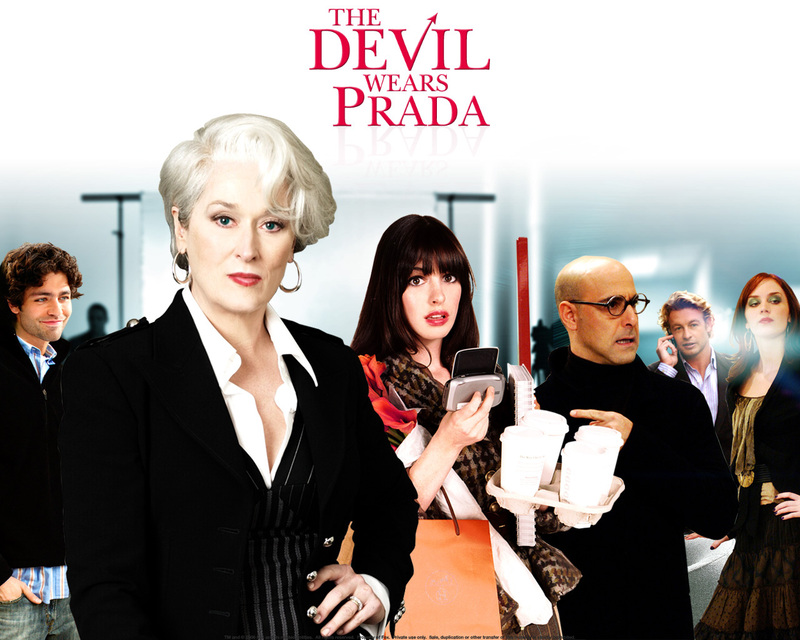 The movie starts with Andrea Sachs (Anne Hathaway) getting a job in the Runway magazine as a co-assistant to Miranda Priestly. (Meryl Streep) Andrea being the simple off fashion person doesnt understand the importance of this job as wherever she went people told her " a million girls would kill for this job" When things get rusty for her, Andy lands up to the art director Nigel (Stanley Tucci) who changes her into a new and fashionable Andy. Surprised by her new looks, Miranda also gets shocked to see the effort put in by Andy who could change the impossible into possible. When Andy changed her clothes and style, she also changed herself which wasn't accepted by her friends and boyfriend. But Andy at the end understands what her old life was and what the people who loved her meant to her. She gives her goodbyes to Runway and ends up working happily at a newspaper. Who doesn't love Anne Hathaway? What a stunning movie with such amazing clothes and shoes. The movie revolves around 4 best friends Carrie Bradshaw (Sarah Jessica Parkers), Samantha Jones (Kim Cattrall), Charlotte York Goldenblatt (Kristin Davis) and Miranda Hobbes (Cynthia Nixon) who are in their early 40's. Carrie is a writer who writes books on relationships, marriages, boyfriends etc. She then meets her knight in shining armor, John James Preston(Chris Noth). They both fall in love and decide to get married but Carrie's friend Miranda spoils everything unintentionally because of being frustrated of her married life. Preston calls off the wedding on the big day. At the end things fall back in place. Carrie and Big (John James Preston) get married. Sarah Jessica Parker's dresses are beyond words and the heels can make any person go crazy. This ones's a must watch. 27 Dresses a 2008 romantic comedy film directed by Anne Fletcher takes us to the world of Jane Nichols (Katherine Heigl) who has been a bridesmaid for 27 weddings and the next wedding she has to attend is of her real sister and her boss on whom she has a secret. When Jane breaks it to everyone that Tess(her sister) lied to George (her boss) about almost everything, the oh-so-cute couple’s marriage comes to an end. My favorite part of the movie was when Jane tries all those 27 bridesmaid dresses. She is looking pretty as ever and her smile is just the cherry on the cake. When the rich spoilt teenager Poppy Moore crosses the line, her father sends her to a boarding school where she meets all kinds of snobbish girls and starts hating her new life. It isn’t long enough when she finally makes some new friends and come down to Earth. The clothes worn by Poppy Moore (Emma Roberts) are just talking about brands and are beyond words. Mean Girls is a 2004 American teen comedy film directed by Mark Waters. Mean girls starred by Lindsay Lohan tells us about Cady Heron who has just shifted from Africa and is homeschooled. She there makes 2 real friends who warn her to avoid the most popular clique group The Plastics ruled by Regina George. The Plastics make Cady their friend, invite her in their clique group and in no time Cady turns into a Plastic herself. Regina and Cady’s clothes are which one cannot miss. A good post, this one! Pretty blog you have!